Rockwell International's “Star-raker” was a heavy-lift ramjet/rocket HTHL SSTO capable of atmospheric cruise and powered landing for maximum operational flexibility. Previous Rockwell studies in the late 1960s indicated Mach 6 turboramjets would be of significant advantage for HTHL TSTOs but only marginal for SSTOs. However, new technologies + fuel tanks in the wings ("wet wings") could make HTHL SSTO possible. The wing surface temperature during reentry would be several hundred degrees lower than for the Space Shuttle because of a lower wing loading. "Star-raker"+advanced airbreathing engines could carry 200% more payload for the same GLOW as Boeing's "Reusable Aerodynamic Space Vehicle" (RASV) all-rocket HTHL SSTO. Star-raker's dry mass would however be 45% higher and the vehicle would be exposed to a higher aerodynamic heating environment than an all-rocket HTHL SSTO. Rockwell also investigated the operational issues and requirements for launching 1600t of payload into low Earth orbit per day. 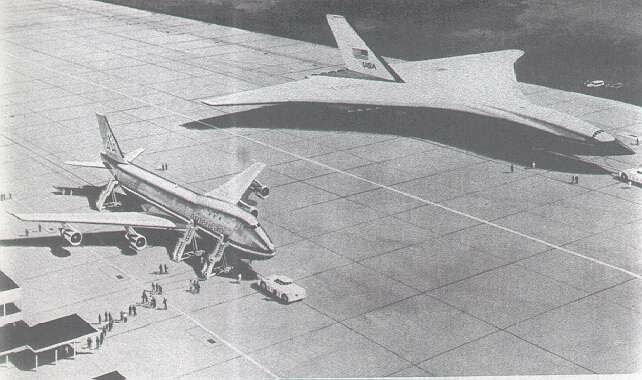 The baseline concepts were Boeing's rocket-powered VTVL TSTO (400t payload capability) and the Star-raker turbofan/air-turbo-exchanger/ramjet HTHL SSTO (100t payload). Although the airbreathing HTHL SSTO concept would require some advanced technologies, it appeared to be better suited for high flights rates (16/day) than the vertically launched TSTO. The VTVL vehicle would require ten launch pads requiring extensive refurbishment between missions, to meet the launch rate requirement of 4 flights per day from the Kennedy Space Center. Two high-bay Vertical Assembly Buildings would also be required as opposed to two aircraft maintenance type buildings for Starraker. The turnaround time for the HTHL SSTO (1.8 days) would be one-third that for the VTVL TSTO (5.5 days), primarily because the latter would land at sea and the requirement for mating & stacking two extremely heavy stages. The risk of recovery damage is considerably higher than for aircraft landing. For the HTHL, a single runway + air base (<20km2 area) would serve an entire fleet of 30 Star-rakers whereas the VTVL TSTO launch range would have to be 850km2 to accomodate a fleet of 22 vehicles and the launch noise & environmental problems they generate (120db at 13km, vs. <120db at 1km for the HTHL SSTO). Liftoff thrust: 20,480KN(sl). Total Mass: 2,278.8t. Payload capability: 100t to a 556km orbit. Cost per kg=$22-33 [1978 economic conditions]. Compatible with C-5A Galaxy cargo and airports (2440-4270m runways) for significant weight & cost savings over top-loading RLVs. Stage 1 : 3 x LOX/LH2 rocket engines & 10 x turboramjets. Liftoff thrust: 3 * 4,750KN + 10 * 623KN. Isp: 455s. (vac.,rockets). Gross Mass: 2,278.8t including 1826t ascent propellant. Empty Mass: 351.9t. Length: 94.5m. Wingspan: 110m. Propellants: LOX/LH2.